The Queen of Memphis Soul is coming to the Ponderosa Stomp, and she’s bringing her talented younger sister with her. 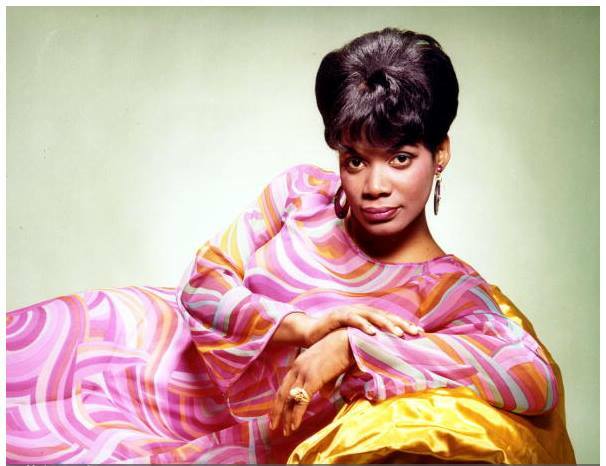 Carla Thomas played an essential role in the successful launch of what would become known as Stax Records, along with her father, the late funk master Rufus Thomas. Carla and her sister Vaneese Thomas were widely acclaimed for their performances at this summer’s Porretta Soul Festival, and they’ll bring the same soul-steeped spirit to the second night of the Stomp that they gave the attendees at Porretta. Growing up in a household filled with music of all kinds was a blessing. In addition to Carla’s massive success, her older brother Marvell became a splendid keyboardist who did plenty of session work at Stax during the ‘60s and ‘70s. The outgoing Rufus was a local celebrity thanks to his daily radio program on WDIA and a longtime gig emceeing the Palace Theater’s weekly amateur contest. That brought his daughter into direct contact with many of the stars of the era. “It was just like second nature to be around entertainers,” says Carla. “It was kind of our upbringing. “Where we lived was a place called the Foote Homes, and it was maybe about only ten or 15 minutes’ walking distance from Beale Street. So even at a young age, Daddy was teaching us rhythmic patterns,” she says. “We learned them streetwise from my dad. My dad was a tap dancer in his early days, so he was really into rhythmic patterns. He would teach us things that Bo Diddley ended up doing on record. We would sing those kinds of songs, and then he’d teach us how to do our hands in different rhythmic patterns. So even at three and four years old, we were doing drum licks, I guess you would call it, and bass rhythms and humming things that were rhythmic. “We grew up on all kinds of music. There was a lady that lived next door that taught ballet, so we heard classical music all the time. And my mother loved country music. She was kind of raised on country music, so we listened to that every morning going to school. She had Bob Neal’s Breakfast Club on, and Red Foley. So we grew up with the real country people. 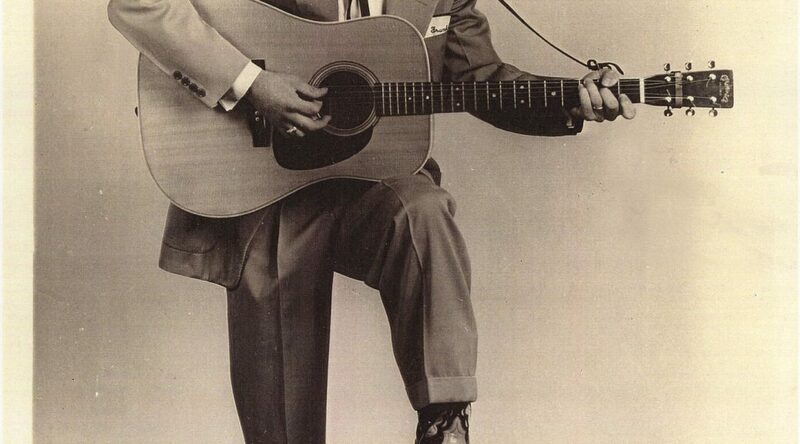 I’m talking about Hank Williams and Hank Snow and Ferlin Husky, long before Elvis. Before long, Carla began following in their footsteps. “I started singing when I was about 11 with a group that came on WDIA called the Teen Towners,” she says. “We provided a lot of the background singing for a lot of the artists that came into the shows that WDIA brought. They were called the Goodwill Revue—that was in the winter—and the Starlight Revue in the summer. So we got a chance to really meet a lot of artists—blues artists, gospel artists. Rufus recognized early on that Carla had uncommon talent. “She was a very good singer,” said the late Thomas. Good enough, in fact, to tape a duet with her father that he could circulate as a demo. “He had bought this tape recorder, a reel-to-reel. He put it down there on the floor one day, right near the piano. He had a song called ‘Deep Down Inside,” says Carla. Rufus wanted to take a look at Satellite Records, originally formed in 1957 as a country and rockabilly label by bank clerk Jim Stewart. 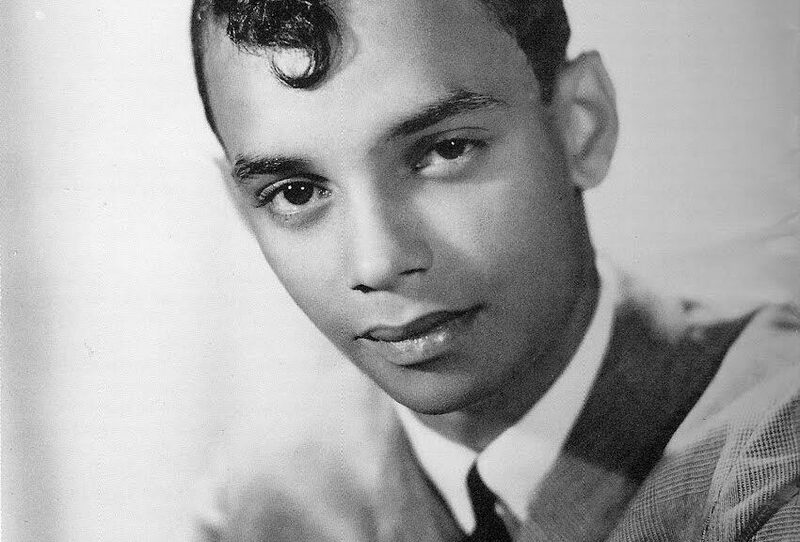 Taking on his sister, Estelle Axton, as a partner the next year, the fledgling firm took over the old Capitol Theater in 1959, shortly after issuing its first R&B platter by a vocal group called the Veltones (by then, Chips Moman had come on board as a staff producer). “Daddy was looking around. They hadn’t even put up any insulation. They were pulling out the (theater seats),” she remembers. “Some of the guys were already there—Don Nix, he had like a little rock and roll band. I think it was Don Nix and Packy Axton, which later became some of the Mar-Keys. So when we were getting ready to leave, Jim said, ‘Well, ask Daddy if he has ever thought about recording again!’ Dad said, ‘Yeah.’ Jim said, ‘Well, you got anything? I could hear it right now before you leave.’ Now that was weird. In his glove compartment, Daddy had ‘Deep Down Inside’ that we had taped on that reel-to-reel. And he went there and put it on the board. They had just put this little board in. It wasn’t but about four tracks. And Jim said, ‘Why don’t we cut that?’ So Daddy was like, ‘Fine!’ It wasn’t like (it was) planned. The braintrust at Atlantic Records heard the platter’s potential shortly after its Satellite release and released it on its Atco subsidiary—the beginning of a mutually beneficial relationship that would see Atlantic distribute the lion’s share of product on the Stax imprint (as Satellite was renamed in 1961) as well as its Volt sister label. A couple of months later, Carla released her solo debut on Satellite. The sweet and innocent ballad “Gee Whiz” made her a national star. “I wrote it when I was 15,” says Carla, who was all of 18 by the time Satellite pressed up her delightful self-penned creation. “I had written a lot of songs like that because of Brenda Lee. I used to try to sing all her stuff growing up, and Teresa Brewer and stuff like ‘A Sweet Old Fashioned Girl.’ That was one of my solos in one of the groups I sang in. And Frankie Lymon’s ‘Why Do Fools Fall In Love.’ I sang songs like that, so I was used to writing. Because that was my era, I wrote like that. “That’s one of the reasons why ‘Gee Whiz’ sounded so girlish, even though I was in college,” she says. Satellite wasn’t Rufus’ first choice for “Gee Whiz.” “He had sent it to Vee-Jay, and they still had it,” says Carla. “They still had it after two years.” Fortunately, Stewart was more interested in the charming ballad, and in breaking Carla and her father as solo acts in addition to their duet talents. “Jim Stewart had a suggestion that we do one, let Dad do one, let me do one,” she says. Time was of the essence in getting “Gee Whiz” on tape. “Because I had to go to school, I wanted to do that first,” says Thomas. 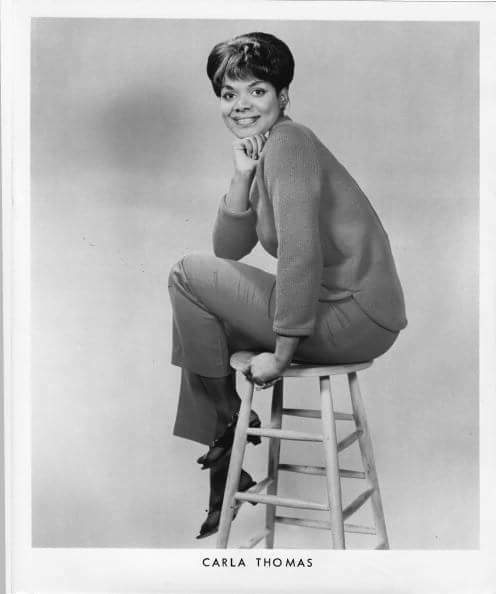 Carla was attending Tennessee A&I University when Satellite released “Gee Whiz” in late 1960. Once again, Jerry Wexler and Ahmet Ertegun were interested. They added a subtitle and issued “Gee Whiz (Look At His Eyes)” on their parent Atlantic logo, despite Carla’s limited touring possibilities because of her studies at school. It took off like a rocket into the pop Top Ten and the R&B Top Five. Carla wrote the flip side “For You” with Chips, who produced her self-penned Atlantic followup “A Love Of My Own,” cut in Nashville and a solid chart entry the next year. “I wrote that while I was there at (the university),” she says. Moman again wrote the B-side, “Promises,” but he wouldn’t be around Stax much longer—Moman and Stewart had a falling out. “I wish we could have kept Chips,” Carla says. “I really liked him very much. We just seemed to click, you know?” Carla penned her next Atlantic offering, “(Mama, Mama) Wish Me Good Luck” (L.C. Cooke, Sam’s brother, was the co-author of the flip, “In Your Spare Time [Please Think Of Me]”). 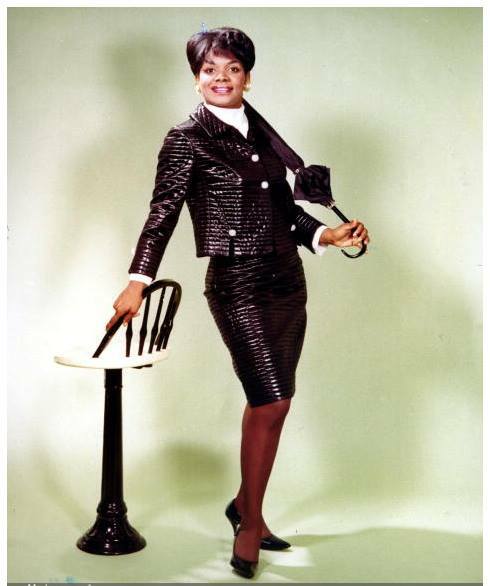 That autumn, Atlantic issued Thomas’s debut album, named after her debut smash and sporting remakes of doo-wop oldies by the Drifters, Five Satins, and Harptones. 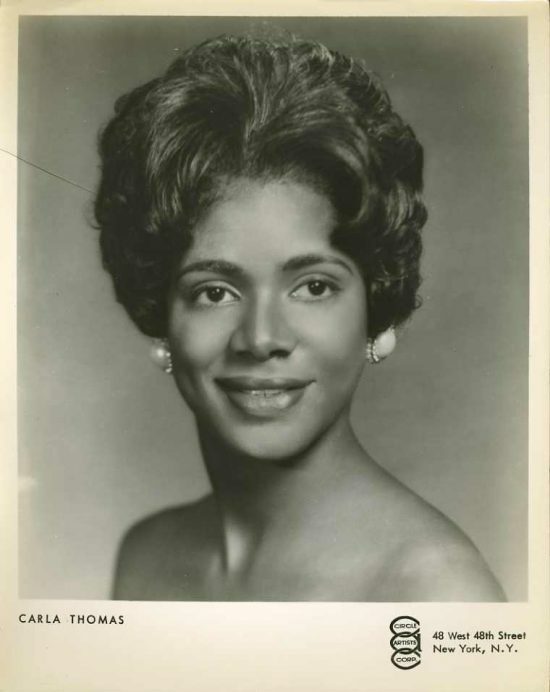 “I Kinda Think He Does,” Thomas’ first single of 1962, missed the charts like its immediate predecessor, but “I’ll Bring It Home To You,” Carla’s answer to Sam Cooke’s smash “Bring It On Home To Me,” restored Carla to the charts late in the year, cracking the R&B Top Ten. Yuletide themes were always welcome in the record racks, and Carla came up with a double-sider for Atlantic near the end of ‘63. “‘Gee Whiz, It’s Christmas,’ now that was like a throwaway,” says Carla. “Somebody (said to) me, ‘We need to do a Christmas song!’ I said, ‘Yeah, I know one: “Gee Whiz, It’s Christmas.”’ But it was done as a joke. But we sat down and wrote it.” Her collaborators were Cropper and arranger Vincent Trauth. WDIA deejay A.C. “Moohah” Williams was credited with scribing the similarly sweet flip, “All I Want For Christmas Is You.” Stax reteamed Rufus & Carla in 1964 for “That’s Really Some Good,” with a hearty revival of the Nappy Brown/Ray Charles belter “Night Time Is The Right Time” parked on the rear. Porter and his new compositional partner Issac Hayes sat down with Raymond Moore to create “How Do You Quit (Someone You Love),” Carla’s last Atlantic single at the start in 1965. 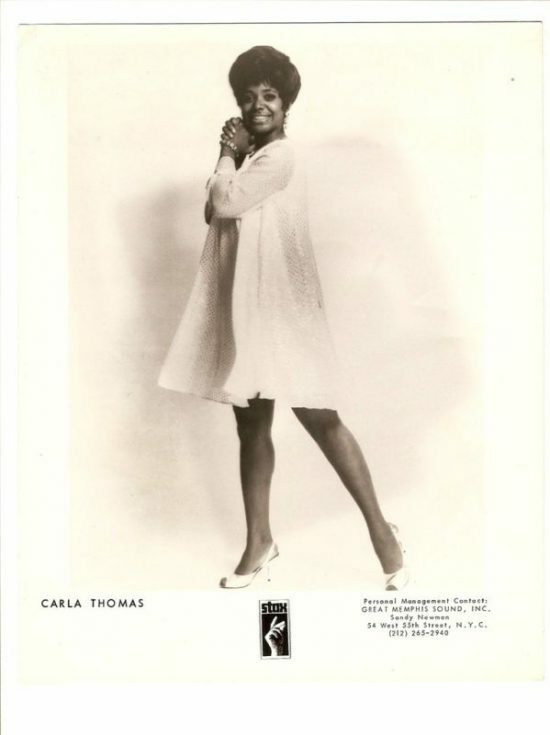 As often was the case, Thomas supplied her own B-side, “The Puppet.” From there, all of Carla’s recordings would appear on Stax, starting with “Stop! Look What You’re Doing” in the spring of ‘65. The delicious number was the work of two fresh faces at Stax, Eddie Floyd and Al Bell. Stax gave the Rufus & Carla combination one more try at the start of ’66, twinning “Birds & Bees” and “Never Let You Go.” It didn’t make a chart ripple, but Carla’s next solo single sure did. “Let Me Be Good To You,” riding a strutting Duck Dunn bass line, was the work of Hayes, Porter, and Carl Wells and proved the biggest hit for Thomas in more than three years. Cropper, Bell, and Floyd had the flip, “Another Night Without My Man.” Carla was all grown up. Hayes and Porter were just hitting their stride, although Carla initially found their next offering less than pleasing. “They had written something for Sam & Dave, and that’s how it sounded,” she remembers. “It sounded to me like ‘You Don’t Know Like I Know.’ And I said, ‘I’m not going to sing that! I don’t like it.’ So they said, ‘Oh, no, no. You should do it!’ I said, ‘I know I should do it, but that’s not me!’ So I’m standing down there, trying to sing for them, and that’s probably where I made a lot of my mistakes. Daddy came and said, ‘What’s going on?’ I said, ‘I’m ready to go home! Let’s go!’ I took that time to get the heck out of there. So the next day, they called over to the house. “So when I came back, they said, ‘We think we’ve got it fixed!’ Because you see, when you write for an artist, you write for that artist. You don’t just throw me a song because you’ve got it left over from another session, especially your top female artist at that time. You just don’t do that. That was the first time I’d ever said, ‘Uh-uh. I’m through. Bye!’ I don’t think I’d ever done that before, but sometimes you just have to. “When I came back, they had Booker. Booker changed the whole song. They don’t like for me to say that, but Booker was on the organ, and they had come up with this little introduction on the bass line. 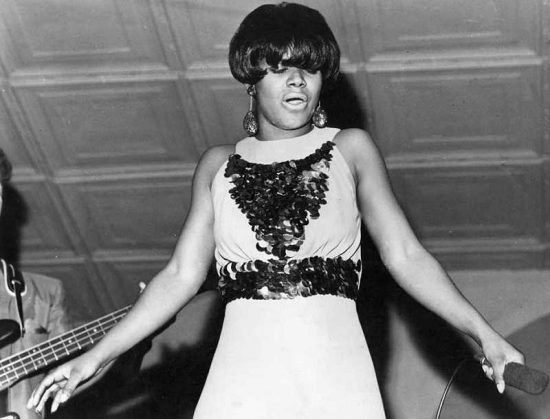 I said, ‘Now I can sing it!’” The song, of course, was the seductive “B-A-B-Y,” and during the summer of 1966 it was a huge hit, topping out at #3 R&B and barely missing the pop Top Ten. Stax resurrected “All I Want For Christmas Is You” to celebrate the 1966 holidays, placing a fresh Hayes original, “Winter Snow,” on the opposite side. And as the new year opened, Carla had another of Isaac and David’s compositions, the delectable “Something Good (Is Going To Happen To You),” climbing the R&B hit parade. 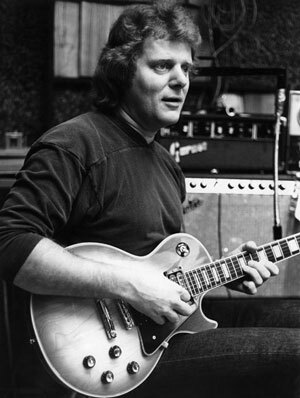 Floyd and new collaborator Joe Shamwell wrote “It’s Starting To Grow” for the B-side. Compositions by Hayes and Porter were flying up the charts. Yet despite both sides of Carla’s first 1967 outing being written by the gilt-edged duo, neither “When Tomorrow Comes” nor “Unchanging Love” dented the charts. So was Aaron Neville’s then-current hit “Tell It Like It Is,” a cover of which nestled on the other side of “Tramp.” “That was my suggestion. We were all coming up with songs, and I said, ‘Let’s cut Aaron’s too!’” says Carla. “Willie Mitchell was managing a club called the Manhattan, and Willie called me. He knew how much I liked Aaron, so he said, ‘Come on up to the club—I’ve got a surprise for you!’ He didn’t tell me it was Aaron. “I got up there and I looked at the marquee, and I went, ‘Whoaaa, God! Aaron Neville is here!’ He said, ‘We’re gonna surprise him! Go on in back and sit down!’ So I sat down. He came out. Now, what people don’t know is one of my first tours was with Dad and with Willie,” she says. “He was an artist then. He had his own band, and I traveled with Willie for awhile. So he had all the charts to ‘Gee Whiz’ because they played them for me. And so he came out, and Aaron sang a couple of numbers. I’m sitting in the back. He didn’t know I was there. He says, ‘And now I’d like to do a song that one of my favorite artists and she’s from Memphis, and I would like to sing her song!’ And they broke out on ‘Gee Whiz.’ I thought I was going to faint! With Hayes and Porter solidly installed as her producers, Carla delivered two songs by other compositional teams for her next solo single that same spring. “I’ll Always Have Faith In You” came from Floyd and Bell and just missed the R&B Top Ten, while Porter got together with Shamwell to brainstorm “Stop Thief.” But it was the dynamic pairing of Otis and Carla that had really grabbed the public’s attention. Their remake of Floyd’s “Knock On Wood” was a hit in the autumn, with a redo of Carla’s “Let Me Be Good To You” sitting on the flip. 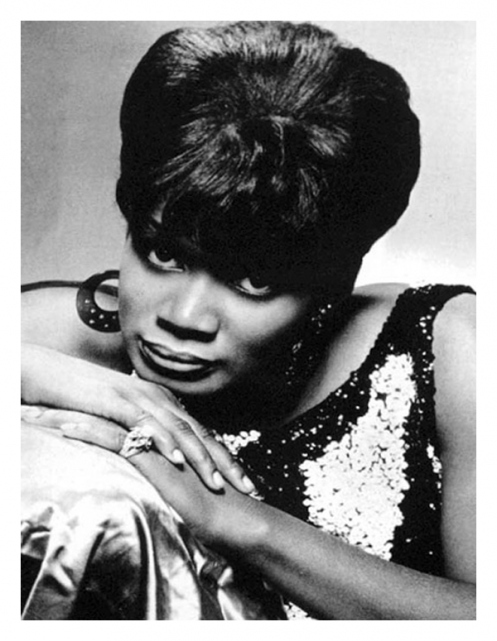 With the exception of Chuck Jackson’s “Any Day Now,” Carla’s 1967 album The Queen Alone was largely free of covers, concentrating to a considerable extent on the voluminous catalog of Hayes and Porter. There should have been another Thomas entry in Stax’s LP catalog that year, but for unknown reasons, Live at the Bohemian Caverns, cut that May, was shelved for four full decades. 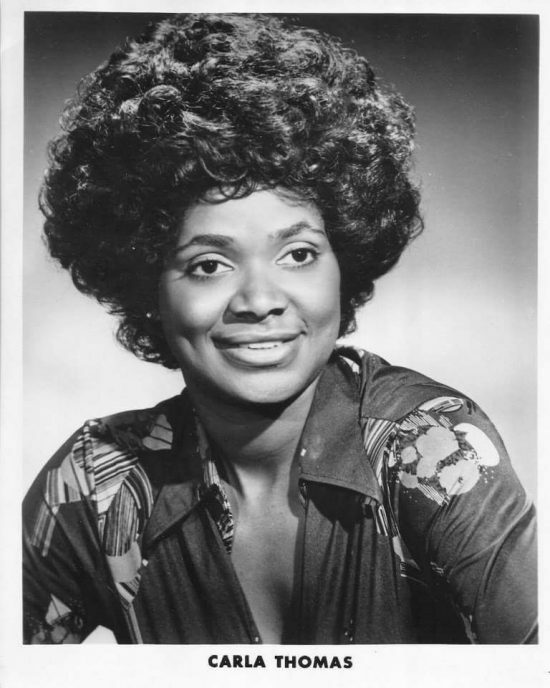 Hayes and Porter wrote and produced Carla’s “A Dime A Dozen,” which failed to show up on the charts during the spring of 1968 with Deanie Parker and Mary Frierson’s “I Want You Back” occupying the other side. Then Atlantic and Stax suffered through a very contentious breakup, and everything changed. The family feeling that defined Stax/Volt during its early years began to erode. “Let’s put it this way: ‘Well, we see Carla and Rufus all the time, but oooh, the Beatles just showed up down here!’” Carla explained. “See what I’m saying? It’s okay to get excited, but don’t forget the people that actually brought you there, that even brought the Beatles there, and Elvis, and all these people that just toured around looking. A change of scenery might have been just the thing to turn momentum around, so Carla and producer Bell traveled to New York to cut her next single. “Where Do I Go” hailed from an unlikely source: the soundtrack of the hit counterculture musical Hair. Instead of the MG’s, Thomas had guitarist Carl Lynch, bassist Chuck Rainey, and drummer Bernard “Pretty” Purdie crafting the grooves. Bell’s insistence on plugging “Where Do I Go” meant that Carla’s own “I’ve Fallen In Love” was relegated to B-side status, making her unhappy. “When I was cutting ‘I’ve Fallen In Love,’ I hadn’t even started singing yet. Bernard, he stopped, he hit the bass drum with his foot, threw his sticks up in his air. He said, ‘This is a hit record!’” she says. “But they wouldn’t listen to the disc jockeys and they wouldn’t listen to the musicians. They were saying, ‘Don’t put that on the back of nothing! Wait!’ But they put it on the back side of ‘Where Do I Go,’ and it got lost.” Both sides mildly charted but ultimately canceled each other out. “The Sweet Inspirations were on ‘I’ve Fallen In Love,’” notes Carla. Bettye Crutcher, Homer Banks, and Raymond Jackson—the same compositional triumvirate that struck gold with Johnnie Taylor’s Stax blockbuster “Who’s Making Love”—were the creators of the bubbly “I Like What You’re Doing (To Me),” Carla’s Top Ten R&B hit in early 1969. Like Taylor’s smash, it was produced by Motor City import Davis, who insisted on overdubbing sweetening in his hometown. The multi-layered method didn’t go over well with Thomas, who was reduced to laying her vocal over a finished backing track. Atlantic still had the rights to all the Stax masters done prior to their split. They unleashed another Otis & Carla single that spring on Atco pairing “Ooh Carla, Ooh Otis” (authorship credited to Redding and Bell) and a cover of Sam & Dave’s luscious “When Something Is Wrong With My Baby.” Stax countered by pairing Carla with Johnnie Taylor on a fresh pair of duets, the Clyde Wilson-penned “Just Keep On Loving Me” and a revival of Chuck Willis’ “My Life.” Both came from the two-LP set Boy Meets Girl, comprised of various Stax duet combinations. The same collection also spawned a duet single by Thomas and William Bell, Floyd and Cropper penning “I Need You Woman” and new recruit Luther Ingram doing the honors on “I Can’t Stop.” Another Bell/Thomas duet, a lovely revival of the Everly Brothers’ “All I Have To Do Is Dream,” came out as a single shortly thereafter. But the public was apparently only interested in Carla singing with Otis. Davis was still looking to his old stomping grounds for suitable writing partners, collaborating with Wilson on Thomas’ last single of 1969, “Some Other Man (Is Beating Your Time),” though he did team up with Hayes and Porter to create its flip “Guide Me Well.” Both songs were also featured on Thomas’ aptly titled and quite strong album Memphis Queen, and “Guide Me Well,” its rhythm tracks cut by Davis in the Motor City with Rudy Robinson on keys, Ray Monette on guitar, and drummer Melvin Davis, was apparently reserviced as the A-side of the single and charted during the spring of ‘70. The film connections of Stax’s new owners brought Carla the material for her first 45 of 1970, both sides taken from the soundtrack of Cactus Flower. Industry heavyweights Cynthia Weil and Quincy Jones wrote “The Time For Love,” and Carole King and Charles Larkey came up with “(I’m Going Back To) Living In The City.” All those big names didn’t help the record one bit on the charts, though. A momentary Memphis reunion with producer Chips Moman—by then living large at his American Studio with its constant stream of hits by Neil Diamond, B.J. Thomas, and Elvis–produced the dramatic violin-enriched ballad “I Loved You Like I Love My Very Life.” Thomas lip-synched her latest number (the work of Toni Wine, Irwin Levine, and the one and only Phil Spector) on the John Hartford-hosted TV program Something Else, strolling alongside a sun-dappled body of water while doing so. “That’s one of my favorite songs,” says Carla. 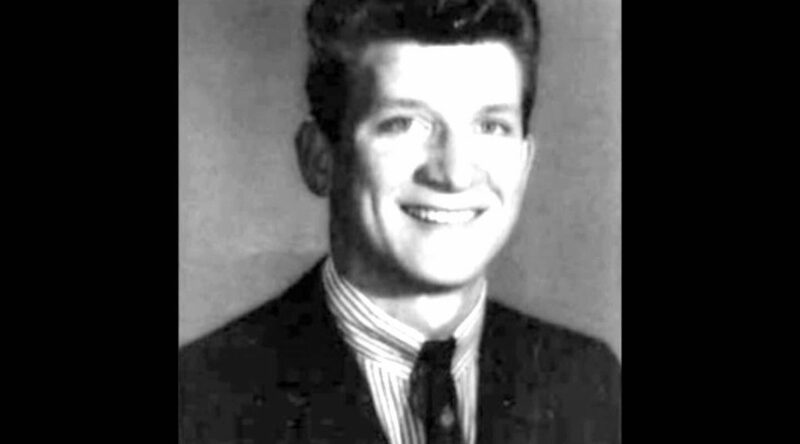 “Just working with Toni was like, ‘Ah!’ But Jim said, ‘I don’t know if we can push that.’ I’m going, ‘Now I see why Chips left!’” Gerry Goffin and Carole King’s “Hi De Ho (That Old Sweet Roll),” also waxed by Dusty Springfield at American, served as the flip. Davis helmed what turned out to be Carla’s last charting Stax single in early 1972, “You’ve Got A Cushion To Fall On,” another creation by Homer Banks and Raymond Jackson with Thomas’ labelmates, the Emotions, providing background vocals. Carla’s keyboard-playing brother Marvell got a chance to produce its B-side “Love Means You Never Have To Say You’re Sorry,” the siblings penning it with Deanie Parker. Both songs graced Carla’s last Stax album Love Means…; Marvell produced the lion’s share of it and shared arranging duties with Johnny Allen. Its contents included remakes of the Association’s “Cherish” and Jimmy Webb’s “Didn’t We”—hardly standard Stax fare. 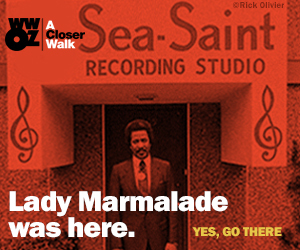 But like Isaac, Marvell often swam against the tide at Stax. Bell teamed with the controversial Johnny Baylor (Luther Ingram’s producer) to supervise Carla’s late ‘72 release “I May Not Be All You Want (But I’m All You Got),” Banks and Jackson brainstorming the tune with Carl Hampton. Marvell and Sir Mack Rice, the latter’s Stax stock sky-high thanks to his having penned the Staple Singers’ “Respect Yourself” with Ingram, brought her the single’s back side, “Sugar.” Stax was allowing a lot of nice Thomas singles to fall through the commercial cracks. Carla was elevated to co-producer status by Al Bell for “Love Among People,” her last Stax 45 in the summer of 1973. Written by Prince Philip Mitchell and Ernie Shelby, the uplifting piece was a worthy swan song for an incredible 13-year run. The Wattstax soundtrack provided its B-side, the moving Thomas-penned gospel theme “I Have A God Who Loves.” And that was it. Unlike so many of her peers who bounced from label to label attempting to regenerate their hitmaking career, Thomas didn’t bother. 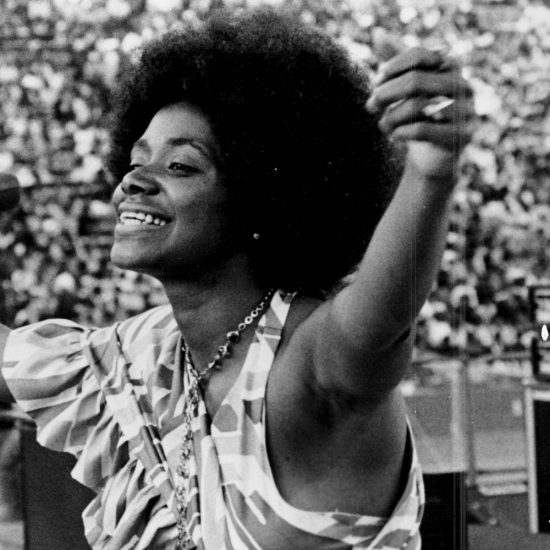 But she did keep right on performing to this day, playing festivals around the world as well as in her own backyard (she’s still a Memphis resident). When Carla and Vaneese Thomas bring their seductive brand of soul to the Stomp, you’ll know you’re in the presence of true soul royalty!